Review by AllTheBestFights.com: 2015-07-03, pretty good finish between Sergei Kharitonov and Kenny Garner but it is not enough to get three stars: it gets two. Sergei Kharitonov entered this fight with a professional mma record of 22-5-0 (95% finishing rate) and he is ranked as the No.22 heavyweight in the world. He suffered his last defeat in 2011 when he faced Josh Barnett (=Barnett vs Kharitonov), since then he has won four consecutive fights beating Kenny Garner in his last bout (=Kharitonov vs Garner I). His opponent, Kenny Garner, has an official record of 16-8-0 (81% finishing rate) and he entered as the No.57 in the same weight class. After losing to Kharitonov in 2014 he came back to win in 2015 defeating Aslambek Musaev (=Garner vs Musaev) and Willian Hoffmann. 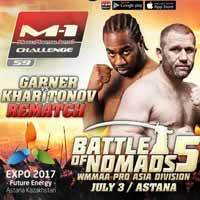 Kharitonov vs Garner 2 is the main event of M-1 Challenge 59. Watch the video and rate this fight!